In an ongoing contract worth millions of dollars (up for renewal 2016), Hewlett Packard provides the Israeli prison service with essential IT services, servers and infrastructure that enable Israel's prisons and interrogation centres to function. These include the notorious Al Jalame interrogation centre in northern Israel where children are caged three floors below the surface in filthy 3m x 1m holes in the ground, left in solitary confinement for up to 65 days. Their only escape being the interrogation room where the children, shackled by their hands and feet, are abused and tortured for 6 hours at a time. HP also implements and manages the server farm for the entire Israeli army and Ministry of Defense - Israel's largest server tender worth $140 million . Those HP servers form the IT backbone of the entire Israeli war machine which has been found guilty of war crimes and possible crimes against humanity by the UN Human Rights Council. Please join us this friday as we continue our new campaign against Hewlett Packard, demanding they end their complicity in Israel's war crimes. HP is more than an office supplies and printers company, they are one of the top 20 defense contractors in the US with arms* sales worth $3 billion in 2011. They specialize in developing the IT infrastructure that is essential for the military to function. Whilst Hewlett-Packard(HP) operates in 178 countries around the world in HP's own words "Israel is one of the few countries where HP has a massive presence.. In the past decade, HP has invested over $6 billion in the acquisition of Israeli companies, including the establishment of production plants.. HP is the second largest investor in Israeli IT." In 2011 HP won Israel's largest ever servers tender, worth an estimated $140 million. Under the tender HP implements and manages the entire server farm of the Ministry of Defense and the Israeli army for 5 years (contract ends in 2016). 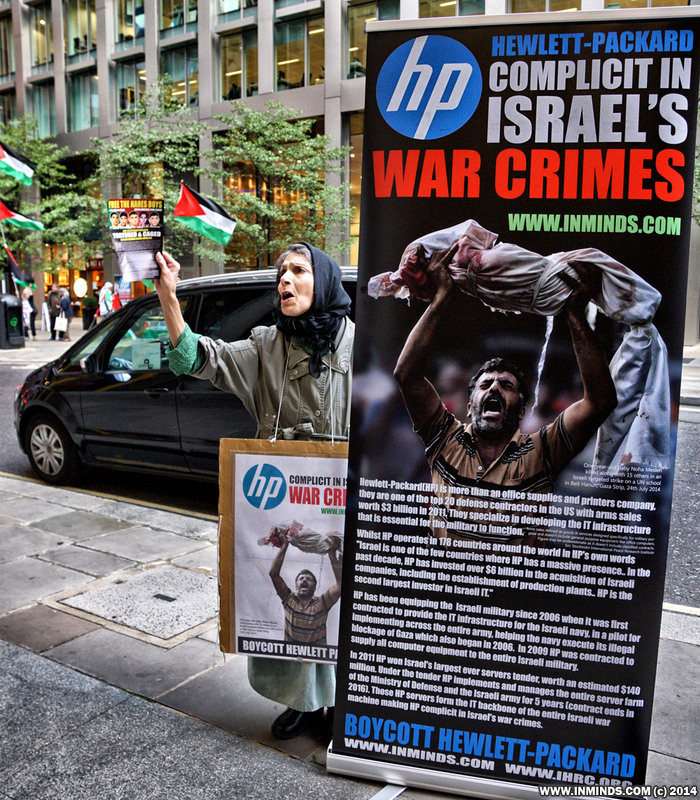 Those HP servers form the IT backbone of the entire Israeli war machine making HP complicit in Israel's war crimes. HP has been equipping the Israeli military since 2006 when it was first contracted to provided the IT infrastructure for the Israeli navy, a virtualization project which was used by the Israeli military as a pilot for implementing the same system to the entire army. HP is thereby assisting the illegal naval blockade of Gaza which also began in 2006. In 2009 HP won the contract to supply all computer equipment to the Israeli military. In another contract HP supply configuration management database system for the Israeli Army's secret IT unit. Currently HP is implementing and assimilating an enterprise resource planning and management system for the Israeli Army (2011-2015). Hewlett Packard is also providing essential IT services and infrastructural that enable the Israeli Prison Service (IPS)** to function. Everyday Israel abducts and cages 2 children as young as 12 years old. Human rights groups have documented the brutal torture of children as standard practice during interrogations in order to coerce confessions, usually to stone throwing which carries a sentence of up to 20 years imprisonment. Today there are over 6000 Palestinian political prisoners, including women and children, imprisoned by the Israeli Prison Service - many locked up without even a charge let alone a trial. 72 Palestinian prisoners have been tortured to death in Israeli prisons since 1967. The latest being father of five young children, Raed Abdul-Salam al-Jabari, who was died following interrogation at Eshel prison on 9th Sep 2014. he had been arrested over a simple car accident involving an illegal Israeli settler. The IPS claimed he had comitted suicide by hanging himself in his cell but the autopsy revealed he had been savagely tortured with repeated blows to the head and face causing brain hemorrhage. His neck showed no signs of hanging. In an ongoing contract (until 2016), worth millions of dollars, HP provides the Israeli prison service the systems and servers needed to keep it operational. In 2012 HP provided the central servers for the operational system of the IPS ("Tzohar") and its ongoing maintenance. In a contract worth $35 million, HP developed the Kidma information system for the IPS which includes the prisoners management system and intelligence subs systems, helping the occupation keep illegal records on Palestinians it has abducted and their families. HP has also executed a project for e-mail storage and archive for the IPS. HP has developed and maintained the Basel System - a biometric access control system with hand and facial recognition, which is used by Israel at illegal checkpoints deep inside occupied territory to restrict and control Palestinian freedom of movement in their own land. It forms part of the separation wall apparatus declared illegal by the International Court of Justice in 2004. HP also provided services to the illegal settlements, in particular Modi'in Illit and Ariel. This includes a data storage system for the municipality of Ariel as part of the "Smart City" project. **We would especially like to thank WhoProfits.org for the research they have conducted on HP, in particular their freedom of information requests that have revealed the extent on HP's complicity with the Israeli Prison Service. 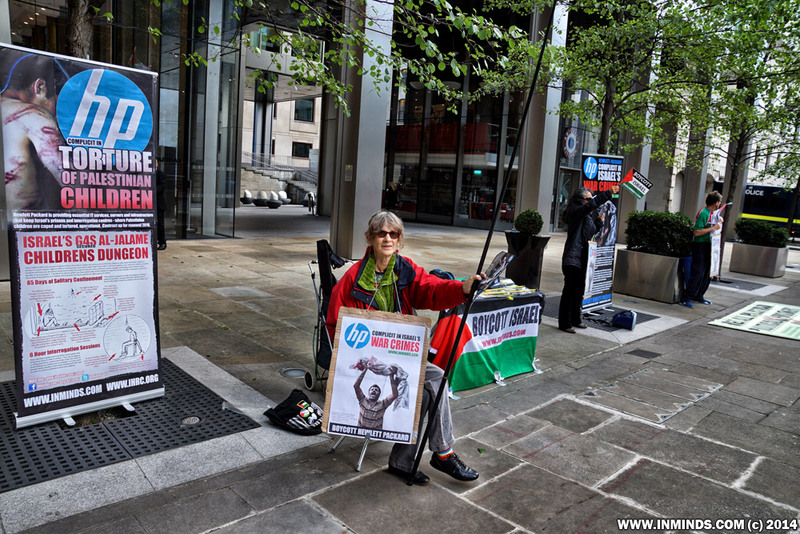 WANT TO SET UP YOUR OWN PROTEST AGAINST HEWLETT-PACKARD? Apart from London HP has UK offices in Bracknell (HQ), Bristol, Warrington, Erskine and Belfast. If any local groups want to set up their own protest at any of these locations please contact us, we can try and help with resources (leaflets, etc). 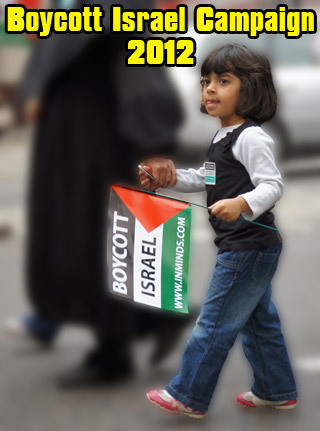 We will, inshAllah, be tweeting live from the protest with live photos being uploaded to our twitter and facebook page. 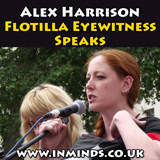 So if you can't join us on the day, please help us by sharing the photos as they get uploaded. If you support this activity please share this alert widely, thank you. The Palestinian Prisoners Campaign aims to raise awareness for the plight of Palestinian prisoners and build solidarity for their struggle and work towards their freedom. The campaign was launched by Innovative Minds (inminds.com) and the Islamic Human Rights Commission (ihrc.org) on the occasion of Al Quds Day 2012 (on 17th August 2012), since then we have held actions every fortnight in support of Palestinian prisoners, if you can spare two hours twice a month then please join the campaign by coming to the next action. On 24th August 2018 Inminds held a vigil outside the National Union of Journalists (NUJ) in London to protest the NUJ's silence at Israel's targeting of Palestinian journalists, and to demand freedom for tortured Palestinian journalist Lama Khater. On Friday 24th August 2018 Inminds human rights group will hold a vigil outside the headquarters of the National Union of Journalist (NUJ) in London to protest the NUJ's silence at Israel's targeting of Palestinian journalists, in particular the case of Lama Khater will be raised. On 3rd Aug 2018 Inminds will hold a vigil outside the BBC, to highlight the plight of Palestinian journalists targeted by the illegal Israeli occupation and demand freedom for imprisoned Palestinian journalists including Lama Khater. On 6th July 2018 Inminds held a vigil outside the Turkish Embassy in London to urge Turkey to put pressure on Israel to release 27 years old Turkish national Ebru Ozkan who was arrested whilst returning home from a holiday in Jerusalem, and caged without charge. On 6th July 2018 Inminds human rights group will hold a vigil outside the Turkish Embassy in London to urge the Turkish government to put pressure on Israel to release 27 years old Turkish national Ebru Ozkan. Ebru Ozkan was arrested on 11th June 2018 when boarding her flight home at Ben Gurion Airport in Tel Aviv following a 4 day holiday in Jerusalem. To mark Palestinian Prisoners Day Inminds, on 13th April 2018, held a vigil on the Southbank of the River Thames in London to highlight the plight of Palestinian prisoners in Israeli occupation prisons, and to demand their freedom. To mark Palestinian Prisoners Day, Inminds human right group will, on Friday 13th April 2018, hold a vigil on the Southbank of the River Thames in London to highlight the plight of Palestinian prisoners in Israeli occupation prisons, and to demand their freedom. Inminds demands the immediate and unconditional release of United Nations award winning Palestinian humanitarian worker Mohammed al-Halabi who has been caged by Israel for 23 months on the most farcical charges. Those who are silent when others are oppressed..
"[Deportation at the airport] We saw the injured [Turkish] men going through.. a lot had a leg cut out of their trousers or an arm cut out of their top. It had been cut out to treat their wounds.. they were covered in blood, blood that had been there for three days, and some of them had wounds that were still bleeding.. What upset me most was seeing the dozen men, one after another, hobbling across the terminal, with a bandaged foot. I couldn't ask them why so many of them had a bandaged foot, I couldn't ask them what had happened, because if they spoke or if any of us spoke to them the Israelis beat the injured person.. We later found out that they had these injuries on the tops of their feet from when the troops came down from the helicopter on the Mavi Marmara, and they came down firing - they had been shot from above. Some of the men that were killed were shot at close range - head and chest, but a dozen of the men who were shot, among 59 people who were shot, they were shot at the tops of their feet - the bullets were coming down.. They weren't given a wheelchair or a pair of crutches, and if any of the other passengers stood up and tried to offer [help].. that person was dragged away and smacked by these Israelis. The Israeli soldiers sat on the floor, laughed and sniggered and made every one of these Turkish men hobble and hop all the way across, some 200 metres, everyone of them, one by one, made to do that purely for the sick amusement of the Israeli soldiers."